Riparian buffer strips are among the solutions considered in order to protect water quality in an agricultural context. 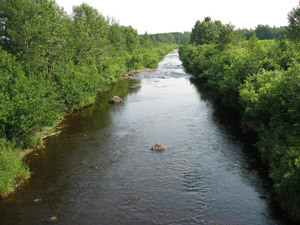 The ecologic condition of this type of habitat is evaluated, in Québec, using the Indice de qualité de la bande riveraine (IQBR) (riparian zone quality index). In order to monitor the quality index, it is necessary to develop operational approaches to map the vegetation in riparian buffer strips, to monitor the changes, to identify the priorities for restoration activities, and to evaluate the success of prior interventions. To do so, traditional techniques are essentially based on field observations, completed with photo-interpretation of aerial photographs. These techniques are however costly in terms of material and human resources. 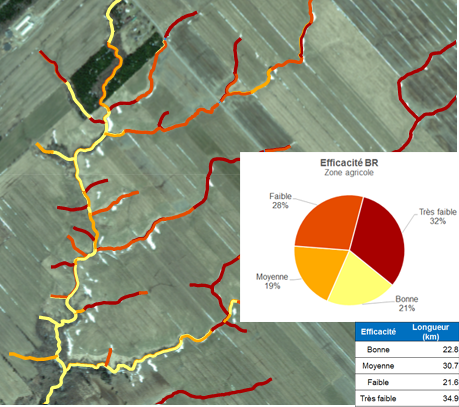 The methodology developed for characterizing riparian buffer strips from very high spatial resolution stereoscopic images will allow managers to: (1) verify the conformance with the applicable law, and (2) evaluate the performance of the riparian zones in fulfilling their ecological objectives, from a point of view that combines land use inventory and stormwater capture capacity. 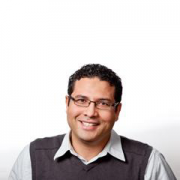 Results show that the new proposed methodology for calculating the IQBR produces results that are similar to those obtained using the current MDDEFP methods. Furthermore, a riparian zone efficiency index is proposed in order to better support the management of these zones. 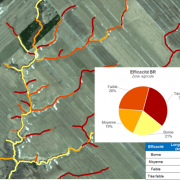 The objective of the project is to develop an operational methodology for the characterization of riparian buffer strips using very high spatial resolution remote-sensing imagery and object-based classification. The developed methodology can be used with any type of very high resolution stereoscopic imagery. The methodology uses standard remote-sensing and geographic information processing and analysis techniques available in most commercial software and in some free open-source software.